The exchange rate of Singaporean dollar against other major world currencies such as the USD, EURO, yen, and AUD has greatly appreciated in the past ten years. The SGD has gained so much strength that the Singapore nationals can travel almost anywhere in the world, for the simple reason that traveling expenses will be less dear than they would be back in the city-state. However, the good lavish days may soon be over, going by analysts’ predictions. For foreigners, setting up a business in Singapore would also be a great idea, as you would get more value for your money after repatriating home the profits earned. The best type of business for a foreigner is a private limited company. With that, there comes the need to know the process of incorporation of a company in Singapore – the requirements, the limitations, and so on. The SGD has had a whole-year high against the USD, but according to analysts, it is feared that this will soon come to an end. This is a sad story for Singaporeans who have been regular travelers worldwide and big buyers on various websites abroad due to the strength of their currency. They could buy things at lower prices from overseas’ websites than from their local retail outlets. Read on for some possible ways in which Singaporeans could minimize the losses prior to SGD depreciating. A majority of Singaporeans buy their essentials online as they are cheaper. Some things, for example Vitamin tablets, are unreasonably costly in Singapore. Vitamins are affordably bought on IHerb as an alternative to local market. Skin care products are bought on Strawberrynet, Amazon (US site), and other retailers abroad. In case you have a taste for a particular brand, it would be wise first to find out if it is cheaper online. Keeping in mind that prices of these items could go up in coming days, shop now for them, and if possible, buy as much as possible to last you longer. You need to compare the price of the goods you buy from online sites with those at the local retailers whose prices could be coming down with the SGD depreciating. Prices also change over time, thus previously expensive items could have become cheaper. The increase in the number of local retailers contributes to a reduction in prices. Furthermore, some of the local retailers are operating online and so offer better deals. They do not incur rent expenses, and local shipping costs are lower. Some local sites offering great bargains include Sunnanz (offers skin care products from Japan, US, and Korea), and Singsale (sells designer, bulk-produced, and sports apparel). Do you like planning for overseas trips long in advance? If yes, you need to be informed that a trip to Paris may be more costly than you expected. As you make arrangement for expensive holidays, be cautious and avoid going on vacations you can barely afford or which will eat up you life-long savings. You may need to change holiday destinations. For instance, you could travel to Japan instead of France or Britain. You may also reduce the length of your vacation to save on accommodation and other related expenses. 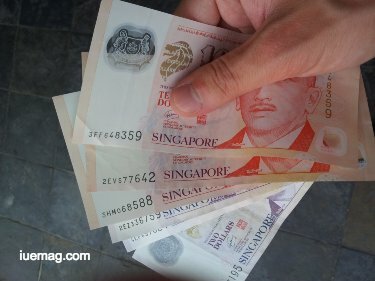 A weakening SGD will definitely affect the lives of many people in the city-state, but with the above tips you could escape feeling the phenomenon so much. Any facts, figures or references stated here are made by the author & don't reflect the endorsement of iU at all times unless otherwise drafted by official staff at iU. This article was first published here on 16th April 2018.